You can choose a user whose context should be used to execute the action here. A specific user can be defined here. The user can also be determined from a system value. Opens a dialog where a system value can be defined. The system value must contain a user GUID. 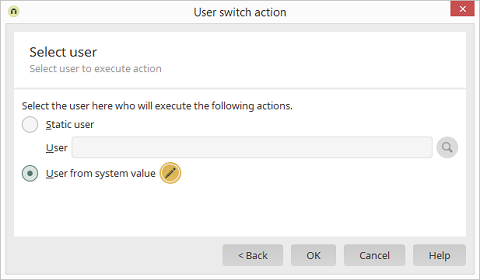 A user who publishes a process with a user switch action must have sufficient permissions to do so. Normally, the user will have these by belonging to the Administrators user group.